Based on the professionalism and speciality of Jiangsu Pioneer Drying combined materials, a recently-produced rotary granulator is mainly used in industries such as pharmaceuticals, foods, granules, chemicals, solid beverages, etc., to prepare the well-mixed materials into required particles. Particularly suitable for high viscosity materials. The parts of the machine that are in contact with the materials are all made of stainless steel, which is beautiful in appearance, reasonable in structure, high in granulation molding rate, and beautiful in appearance. 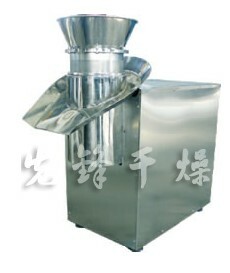 Rotary Granulator Performance Features The machine is made of stainless steel, which is in contact with the material. The appearance is beautiful, the structure is reasonable, the granulation molding rate is high, the particles are beautiful, the material is discharged automatically, and the damage of the particles caused by artificial discharge is avoided. It is suitable for flowing water. operation.